1,594 backers pledged $69,581 to help bring this project to life. 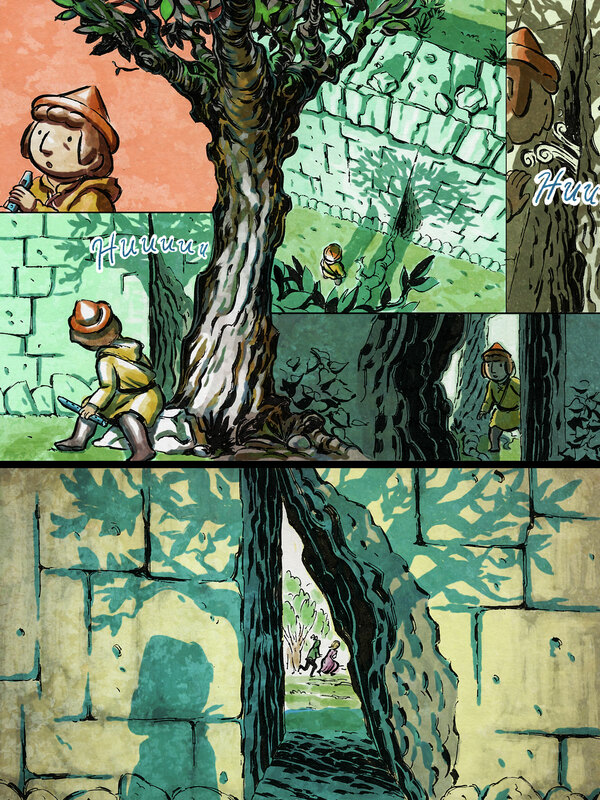 Second Quest is a stand-alone graphic novella inspired by Zelda. It's an original story about a young woman from a small town in the sky who begins to suspect that the legends about her home aren't true. If you like mysterious landscapes, non-princesses, videogame criticism, or general gorgeousity, then please consider backing Second Quest! UPDATE: In December, every backer will receive a 6-page digital mini-comic – “Side Quest” – as a thank-you for all the support this past month. Download the first two pages in high resolution here and here. David and I are both huge Zelda fans. We love the adventure, the challenge, the constant sense of discovery. We especially love exploring worlds full of secrets. Last spring, after my essay “Saving Zelda” was published, we started talking about all our frustrations with the latest in the series, Skyward Sword. With all the handholding, there was little to discover on our own. We didn’t have to pay attention – the adventure just kind of happened. We couldn’t really get lost in Hyrule, even if we wanted to. As we talked, an original story of our own emerged, one that took these Zelda problems (common to many other modern games as well!) and explored them in comic form. The idea was for a short comic at first, but it quickly grew much bigger over the summer as we developed the story, characters, and world. By the end, we found ourselves with the script and concept art for a complete graphic novella. 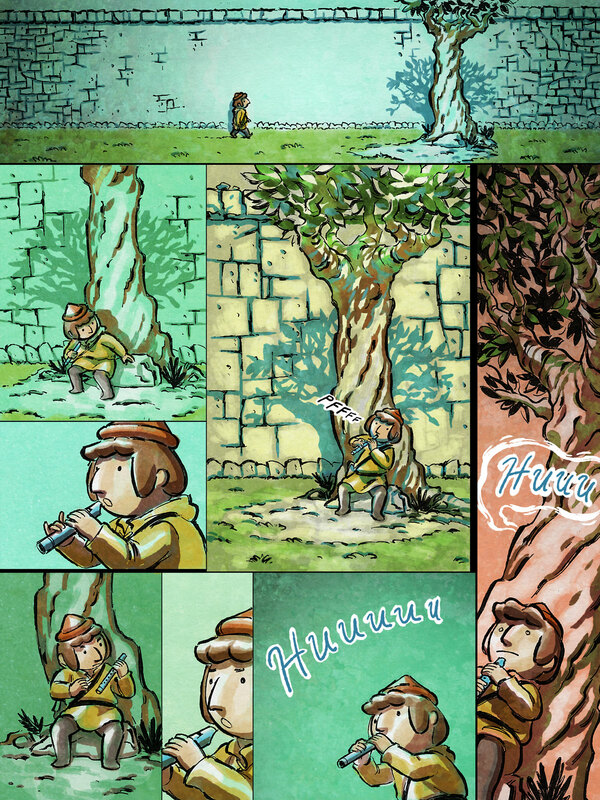 Second Quest is a comic for those who love videogames but want more compelling worlds and a sense of real discovery. Zelda fans will enjoy familiar motifs turned upside-down, but you don’t have to know Zelda to enjoy our story. It’s for anyone who’s felt the pull of distant landscapes and longed to explore a world full of mystery. Second Quest will be a 50-page full-color hardback when it’s completed next year. But this will only happen with your support. If you’re familiar with David’s work on Braid or A Lesson Is Learned But The Damage Is Irreversible, then you know how beautiful and evocative his drawings are. But creating a comic of this length takes lots of time. And publishing a high-quality book, while more affordable than it used to be, is still quite expensive. With Kickstarter, though, we can make possible a comic that would otherwise not exist. If you’re new to Kickstarter, this is all-or-nothing funding. So if we don’t reach our goal, we won’t get a cent and our comic won’t happen. But if we do…well then, a whole slew of rare and delightful treasures will be delivered to your door. We are thrilled to be partnering with Fangamer for the production and distribution of Second Quest. Fangamer produces incredibly gorgeous books, t-shirts, posters, and more, and they ship all over the world. Working with Fangamer means we'll have a rock-solid operation for order fulfillment, and the physical objects will be beautiful. UPDATE: Tiers $50 and above now include a SIGNED dust jacket and a unique set of TRIPTYCH images. Also, a NEW TIER has been added: Cameo in the Comic. The "Side Quest" mini-comic will go out to all backers in December (you can see the first 2 pages on Venus Patrol). Please check out the updated tiers below. A young woman discovers that she can draw out memories from objects just by touching them. But what these objects show her does not fit the legends she’s always been told. What will she discover about her island home? And what place does a curious, daring young woman have in a world that has already been saved? David is known for his beautiful landscapes in the videogame Braid, as well as his bold experiments with layout in the webcomic A Lesson Is Learned But The Damage Is Irreversible. Both of these are central to Second Quest, which explores both our longing for distant landscapes and our protagonist’s ability to see images from the past (a kind of comic-within-the-comic). You can learn more about his work at davidhellman.net. Tevis writes both essays and fiction about videogames. “Saving Zelda” provided the critical background for Second Quest. He's also experimented with fusing videogame elements to realistic fiction in “It’s a Secret to Everybody”. You can read more of his work at tevisthompson.com. David painted living landscapes for the videogame Braid. David experimented with page layout in A Lesson Is Learned But The Damage Is Irreversible. Our biggest challenge will probably come in the timing. We've scheduled everything for the next year and tried to anticipate contingencies, but there are sure to be minor hiccups along the way. In any case, we’ll stay in contact during the whole process and keep you updated. DIGITAL COMIC: A PDF of Second Quest. THE BOOK: The print edition of Second Quest (hardcover, full color, ~50 pages), along with the PDF. DIGITAL TREASURE TROVE: Tons of bonus digital content (concept art, alternate early designs, the complete script), as well as the book with MAGIC DUST JACKET, plus the original PDF. THE SHIRT: An official Second Quest shirt. All previous tiers included. OVERWORLD POSTER: A deluxe map poster of Second Quest, rendered as a videogame overworld. All previous tiers included. FINE ART PRINT: A giclée art print from the world of Second Quest. All previous tiers included. CAMEO IN THE COMIC: Become immortalized in the world of Second Quest by lending your face to a background character. All previous tiers included. INK DRAWING: An original Second Quest ink drawing by David depicting a unique “View of the Island”. All previous tiers included. OIL PAINTING: An original Second Quest oil painting by David. All of treasures included.